This is a very practical book on the value of behavioural techniques in the treatment of children with various disorders including hyperactivity, conduct problems, autism and communication difficulties. Written by an international group of experts, it will provide practitioners in the field with a clear picture of the value of behavioural methodology. It also stresses the necessary assessment and evaluation procedures required in order to implement the techniques appropriately. 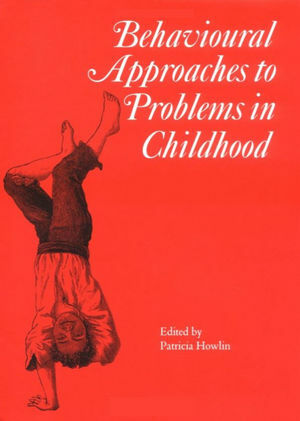 Patricia Howlin is Principal Clinical Psychologist at the Maudsley Hospital, London, working mainly with autistic children and those suffering from pervasive developmental disorders. She is also Senior Lecturer in the Department of Child and Adolescent Psychiatry and Psychology at the Institute of Psychiatry, London. She has been involved in research and treatment with autistic children for many years. Her research interests include a follow-up study of autistic individuals, and a comparison of young autistic adults and a matched group of individuals with severe early language delays. 1. Introduction; 2. Conduct disorders; 3. Hyperactivity and attention deficit disorders; 4. Autism; 5. Learning disabilities; 6. Communication and language disorders; 7. Sensory difficulties; 8. Developmental problems; 9. Cerebral palsy.